Respected scholar and speaker Larry Richards offers a balanced, evangelical-friendly approach to spiritual warfare based on the book of Ephesians. Unique among books on warfare and deliverance, this easy-to-follow handbook draws riches from the Bible, while also offering tactical guidance for conquering the demons of fear and doubt that assail believers. 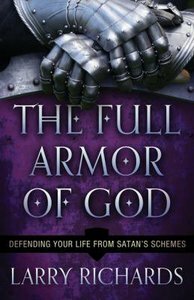 Framing his teaching on Paul's armor of God passage in Ephesians 6, Richards uncovers strategies of Satan and analyzes the armor piece by piece to reveal how God provides protection from every attack of the enemy. Hands-on exercises at the end of each section, plus in-depth, analytical appendixes, help readers identify and stand against powers of evil--and experience true freedom. About "The Full Armor of God: Defending Your Life From Satan's Schemes"
Customer Reviews For "The Full Armor of God: Defending Your Life From Satan's Schemes"
I came to this book with little understanding of the armor of God. This book was wonderfully simple and easy to understand. It explains the context of Paul's teaching in Ephesians and how it applies to us today. The author then goes through the pieces of armor one at a time. He describes how each piece was used by the roman soldiers of Paul's day which opens a world of new understanding in  our use of it now. He writes about how we are to 'put on' the different pieces and other vital aspects of this resource God has provided for our protection. The author is clear and concise in his explanations without overwhelming you with technical jargon or unnecessary information. I highly recommend this book to those who are seeking to understand the armor and how to use it. Any already with an understanding would also benefit from reading this book as it contains a great deal of information not easily accessed.